Travels and Tribulations in the Irish Republic — a Great Craic! Lying in the Atlantic Ocean off the west coast of Britain, the Irish Republic occupies around 85% of the island of Ireland. Centuries of struggle against English colonialism led to the formation of the Irish Free State in 1922 and full sovereignty in 1937. Northern Ireland is constitutionally distinct as a part of the United Kingdom. The Republic — what Ed refers to as 'Ireland in all that follows — comprises coastal mountain ranges, undulating hills and peat bogs. Ireland was shaped by the potato famine. For six years from 1845 the land that relied upon the potato was undermined by a disease the ravaged their staple diet, resulting in the death of over 1 million people. The Famine began quite mysteriously in September 1845 as leaves on potato plants suddenly turned black and curled, then rotted. The cause was an airborne fungus (phytophthora infestans) originally transported in the holds of ships traveling from North America to England. Many Irish escaped their blighted land by choice — or force — and, ironically, emigrated to Canada or America. It is not surprising, therefore, that Ireland is a popular tourist destination for Canadians and Americans keen to trace their roots. The B&B sounded good on the website. 'En suite room. Tea/coffee facilities. Tastefully decorated rooms overlooking the Killarney countryside. Extensive breakfast menu, evening meals optional.' We booked. We arrived. An overpowering, middle-aged, brown-as-a-nut lady greeted us dressed like a teenager in multi-slit jeans, eloquent on the beauties of their surroundings, the plays we could go to, the walks we could walk, the good times we would have. It all started very civilly with tea and biscuits. We took our cases to our room, shut the door, and then had this sinking feeling all was not what we quite expected. Yes, all rooms were, as advertised, 'tastefully decorated', and everything was in its place: its rightful place. In fact, there was only one possible place for anything. Now we understood why they had a 'TV lounge' rather than put a TV in the bedrooms. It was not for social reasons: there was simply no space for a TV in the bedroom! Hanging on a wall bracket, perhaps? Forget it. All free vertical space was required to move. And we had rather hoped for an en-suite bathroom big enough to contain our towels, big enough to turn around in, bend over in, perhaps, and hopefully with a basin large enough to contain more than a single hand. Hopefully a bedroom large enough to allow us to walk without the need to step over our suitcases every time we took a trip around the bed. And that wonderful view overlooking the Killarney countryside? From our window we could only see a nearby hedge. Nothing else — and a very dull hedge at that. Not exactly a view for watching the sundown. And the tea and coffee making facilities? When we asked the lady of the house about these missing items in the room we were informed that she and her husband would make any drinks required. They, it appeared, were the advertised 'tea/coffee facilities'. Could we at least drink water from tap? "No! Get it from the kitchen. It's not recommended for drinking." We were given two small glasses of water to be going on with. So what to do? Obligations are one things, but happy holidays are another. And we do drink lots of water in a heatwave — and why buy bottles when drinking water should be on tap? And where could we put a stack of water bottles? Could we survive in that room for a week? H was not a happy bunny at the prospect. Nor was I. We fled the place in our hired car to discuss the options. Perhaps a compromise: we leave right then and pay for a night or two to cover inconvenience. A short drive away there were a multitude of competing B&Bs, all with vacancies, so we figured investigating the options would be a good plan. At the first place we tried, an impressive manor house/farm, we met one of the more senior ladies of the house who was weeding. She scuttled inside like a frightened mouse, but reappeared reluctantly when we rang the doorbell. But what an elegant and true lady she was as she offered us the choice of two rooms with mountain and lake views in a coach house annex, both huge, tastefully-decorated rooms with huge en-suite bathrooms, plus a separate sitting/conservatory space with view attached to one. Then she showed us inside the manor house and its resident's lounge and dining room, both resplendent as something in a stately home or from Hello! magazine: ornate, gold-leafed furniture, silver salvers and Chinese-plate surrounded us. We felt so at home! All this for 3 Euros per person extra per night and in such a peaceful and tasteful haven. So, as you will guess: difficult decision. Suddenly the impasse was broken by a roar from the lounge as the gentleman of the house burst forth through a nearby door, clearly forsaking the World Cup on TV to join us, red in the face, fists clenched. Had his football team let in a penalty, I wondered? "Get out, get out, we're better off without your sort," he screamed. Basil Fawlty would have seemed calm by contrast. I rather felt he shot himself in his wallet at this point. Suitcases rocked wildly on their little wheels as we fled to the car and abandoned ship, keen to follow Mrs. Slit's sage advice of: "Go, just go." All offers of further reimbursement died a natural death as we looked back on her efforts to suppress that football fan's bubbling anger, something all-consuming that did strange things to his complexion, a sort of volcanic action that would clearly break the barrier that his wife formed in the front door at any moment. Irish tempers? Tell me about it! Any further attempt at negotiation would clearly have been of a physical rather than a financial nature, and that's not the ideal way to start a vacation, now is it? So we sped away, not even bothering to wave a goodbye to our new dear friends, testing out the acceleration properties of our dinky little diesel car. (Surprisingly good, by the way.) A few minutes later we arrived at that nearby peaceful haven, B&B#2, with its breathtaking views of the lakes and mountains of Killarney. Thank you God for being with us on vacation! The peace of that haven and the surrounding area of Killarney was only spoiled by our hire car's verbose nature. The little Kia Cerato — not what we ordered, but a willing little thing — liked to converse every time we got anywhere. It chimed when I opened the driver's door. It chirped when I left the keys in the ignition, it worried itself ragged that we might do something it disapproved of like some maiden aunt. So do the Koreans really think it so dangerous to leave the key in the ignition when still seated in the car? Want to open the window? Then turn on the ignition. Do that and it chimes when you switch it off again. So much music! Try arriving quietly in this car at a car park. The quizzical looks of others only matched those of our normal arrivals in an English car park in our own car when it is our dog that does the calls of greeting to all and sundry. But I digress. Did you want to know about Ireland? As I travelled the roads of the Republic, I was constantly aware of the EU influence. Everywhere there were white and blue boards boasting of EU funding for 'pavement improvements schemes' (for roads in the country that never had, and never would have, pavements) and, best of all, I thought, and so Irish, an 'inane realignment' scheme. Now I checked the dictionary, just in case I was awry here, but the definition of 'inane' is 'silly, senseless'; well, I guess they have to spend all that EU money somehow... and somewhere! Maybe I'm just unobservant, but can anyone tell me of a board alongside English roadworks telling of how the EU have helped to fund them? Our EU money just seems to go into a bottomless pit. Or so I thought, until I visited Ireland. Why, or why, don't we get some of this funding for our terrible roads in England? Does the goverment think this would make us a charitable case after all we've put into the pot? I did hear a whisper about EU grants to help B&B accommodation. Which, maybe, just maybe, explains why practically every other house offers B&B in rural Ireland. Either there are millions of visitors in the Irish countryside all the time — and frankly, I wonder where they were all grazing when we were there if this is so — or there is something a bit unbalanced — even 'inane' — going on here. I wonder how long a B&B has to function as such to get EU assistance with its improvements and refurbishments? Or how many customers they need before they decide to stop and enjoy the fruits of their grant more exclusively. That's not to say grants are not available in other EU countries, of course: just that Ireland seem to be particularly adept at the process. Or maybe it is just that the English are inept. The Irishness of Ireland is even painted on the roads, with warnings written backwards. So sensible, of course, if you think about it, but so Irish: 'TAKING OVER- NO' is a fine example. At least, I assume this is a traffic hazard warning and not just a cryptic message for the English. And the roads were good. Very good, thanks, chiefly, to EU funding. (Did I mention that?) Many have a yellow dashed line at the side separating a strip of road anything from a metre to a car lane wide. Responsible and considerate lorry and tractor drivers, even empathetic car drivers, pull across into this lane to allow others to pass when this is clearly their wish. A great scheme, I thought, and the width of the roads to allow this was impressive for roads that were basically single lane. A good scheme, I thought, which fringe EU money could improve many roads in other countries. So, pretty advanced stuff in Ireland. Forget the old images. But, is the EU TAKING OVER - NO? I am ahead of myself. It all started in Dublin, for that is where the cheapy flight touched down. The no-frills airline had clearly negotiated the most distant gate in the airport, so the price to pay was a walk half across Dublin to get to our baggage along stuffy passageways in a heat wave. I wondered if I would still be breathing at the end of the 10-minute walk. Yes, they do get sun in Ireland when I'm there, despite the normal plan of rain. Any way, we wanted to begin with Dublin. That was surely worth a day at least. We picked up our hire car from the airport and headed for 2 nights B&B just outside the city in an area called Swords. This was where our first tribulation began: geographical in nature. "It's only a seven-minute drive from the airport," we were advised by the B&B owner when we booked on the telephone. Yeah, right. If you know where you're going, maybe. "Just take the N1 from the airport to the third roundabout, third exit, third road, etc." What we didn't realise is that when we emerged from the car pick-up point we were already on the N1. So when we saw a motorway sign for the M1 with N1 in brackets, we assumed it would lead us efficiently to the N1. Sound reasonable? Big mistake in Ireland. (Yes, it was possible to get back to the N1 from it — the road we were already on — so this was merely Irish, not incorrect.) This soon became clear as we headed away from the outskirts of Dublin. And yes, we did find our way back to a different point of the N1, but we didn't know we were on it, where we were on it... To cut a painful story short — not before time — a phone call and a few worries later we did find the place, and we enjoyed a rather cramped stay there for a couple of nights. It was already night when we got there and the bed was very welcome. We needed a rest, for we had only the following day to 'do' Dublin. You should not leave Dublin's fair city without having your picture taken with sweet Molly Malone! Like any city with a history, there are so many things to see in this city. Normal tourist 'must-see' locations include Trinity College and the Book of Kells: a virtuoso display of richly decorated Latin Gospels script and painting by monks done at the Monastery of Kells in County Meath around the year 800. 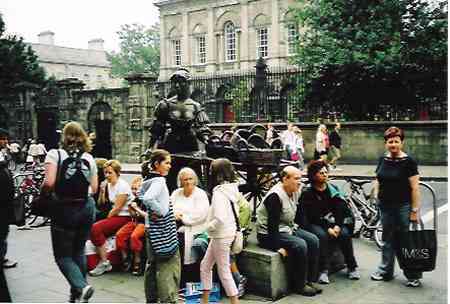 Then there is the National Museum of Ireland, St Patrick's Cathedral, Christchurch in the Viking/Medieval area, Kilmainham Gaol, and endless other destinations, including the famous statue of Molly Malone who 'wheeled her wheelbarrow, through streets broad and narrow'. This statue shows her displaying an extraordinary degree of décolletage to remind us of her subtle way of informing customers about her night job, described by Dubliners variously by calling her 'Moll the Trol', 'The Trollop with the Scallop' and 'The Dolly with the Trolley'. The rules have it you should not leave Dublin without having your picture taken with her — so please bear this in mind. 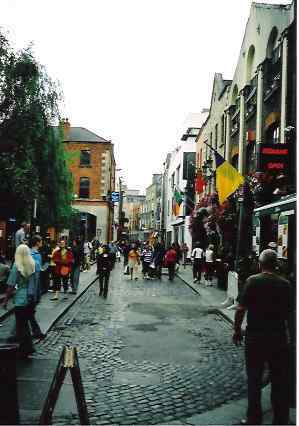 The guide books tell you to visit Temple Bar. In the 1980s this was a rundown area due for demolition but today it is said to be Dublin's trendiest, liveliest and most innovative quarter — but perhaps best avoided by the youngest/oldest members of the community at night. Eateries, proper restaurants and pubs rub shoulders here, as do musicians, especially at its heart in Meeting House Square. Quite frankly, in daylight, I didn't think it was anything special on a global scale — a mere snippet of what some cities offer — but in Ireland I can maybe accept the hype. And, be fair, I did not see it at night. I preferred the ancient peace of nearby Christ Church (ten minutes walk away). How to find all these places? As with all cities, get a tourist street map, of course! How long to spend in Dublin? Wel,l that rather depends on whether you are a city person or not. Do you like following up history? Visiting museums and famous prisons? Shopping? The Guiness factory? if you've the head. Etc. How long would you allow for London? My suggestion would be go for a little less than London. 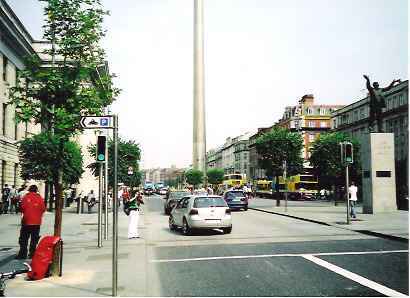 There are many hotels to stay at in Dublin but it is popular, they are in high demand, and prices are therefore also high. If you find somewhere cheap, expect it to be cheap! You could do as I did and stay outside the city, preferably near a DART station, and that is cheaper for the right reasons. I did it mainly so there would not be a problem with car parking — and you saw how that theory went pear-shaped! After Dublin we headed out for the famous Lakes of Killarney, but I decided to take a little diversion first — one that would double our travel time to around 10 hours! The thing is, I wanted to see what the Wicklow Mountains were like in Co. Wexford and these were too far away for a day trip and would take too long on our return to the airport. So we drove on the R758 around Pollaphuca Reservoir on the R758 and hence on, via the R756 through the mountains to picturesque Laragh and then on, via the R755 and R732 to Avoca — which is special to viewers of the TV comedy series Ballykissangel that was filmed there. The mountains were — well, mountains, really, nothing too unusual or special — but the scenery was great. Then on via Waterford, Dungarvan, Fermoy and Mallow to Killarney, our final destination. We made a late lunch stop at the little but pleasant town of Lismore with its impressive Lismore Castle and gardens. We would have liked the time to check these out but the rest of the 10 hour drive awaited restlessly. The scenery around the south coast of Ireland may be pleasant, but from what we saw, it cannot rival that of the Kerry peninsulas that we were heading for, so I will not dwell further on this flatter part of the country. The car is chiming impatiently and we must be off. What a buzz there was in Killarney. As soon as we hit it and, missing the correct turning, ended up driving through the busy part of town, there was no missing this — although there didn't seem to be any actual centre as such. Some would say this is a commercialised town that does not represent Ireland. Perhaps so, but I liked it — although I could never quite learn to find my way around it in the car or on foot. This is the smallest place I ever kept getting lost in. I normally pride myself on my sense of direction, but it seemed to desert me here, time after time. How does it do that? It has a High Street, but there are other main streets that look much the same if you emerge mid-way along them; I think that is the source of my confusion. Or maybe it is the fact that the High Street becomes something different at one end. And although there are roads that ring the town, there is not a ring-road as such — hence my excuse for motoring confusion. But it is a pleasant enough place to get lost in, throbbing with locals, tourists and language school children to add a cosmopolitan edge to a town that is surrounded by the most beautiful parkland: Killarney National Park. It has a cathedral, although I have to say that its bland exterior was only surpassed by its bland interior. But the park— oh the park! 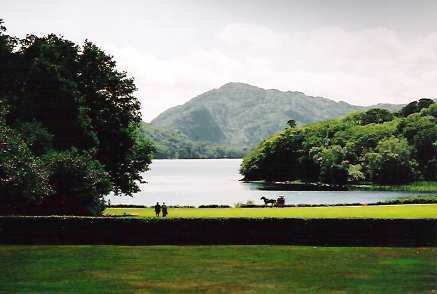 There are 'jaunting cars' (horse-drawn carriages) at every turn to take you for rides in the lush park that borders the huge Lakes of Killarney, and behind the lakes there is this delicious backdrop of tall mountains, especially the tall Mullaghareirk Mountains. Mountain peaks around here have names like Purple, Tomies, Eagle's Nest, Mangerton and Stoompa. If you go to Killarney — and I insist you do, for this is a little green Switzerland not to be missed some time in your life — DO make sure you get hold of the publication called Guide Killarney (which has a Guide Killarney website counterpart). Websites are all very well but there's nothing like a piece of paper when your travelling unknown roads across mountains, I always think. And the paper in this particular guide covers everything you need to fully explore the Killarney area and the surrounding peninsulas. It is concise and clever; [square brackets are used to show optional diversions to sites that might be of interest, for example]; if you don't want the detour you just ignore the stuff in the brackets. And the town map in the guide is essential, as are the other larger-scale maps of particular areas of interest; these include virtually every footpath and, believe me, there are plenty of those. Whether you are a serious hiker or a country-loving walker, Killarney will not disappoint; although the weather is never guaranteed in either Ireland or a mountainous region. The only thing that disappointed us was that a week was too short! What follows are some of the delights you can sample while in the Killarney area. There are more pubs you can raise a glass in and more eateries in shops or hotels than you can wield a fork in — for many weeks. Despite being a bustling centre of tourism, Killarney oozes character, and when an event takes place it has a great craic - an almost indefinable Irish term for an occasion where things seem to gel so naturally that all feel a part of the whole: a people-powered synergy, in fact! This usually applies to music, and sometimes you get it and sometimes you don't; and you always know it when you do. Try The Danny Mann 'world famous singing pub', for example, for guaranteed traditional Irish music from a band every night from around 9:30 pm. Arrange to be eating at this time to ensure a good view; once you finish dining the food stops from this time, but you need to have secured your table with a meal ticket first. Otherwise you can only watch the band via a screen in the adjoining bar. There are many other pubs that offer music, of course. This is Ireland, for heaven's sake. Here, they like to come out of mass of a Sunday morning and round it off with music! There are small shops and gift shops, a tourist office, hotels and, as mentioned before, there are jaunting cars to take you into the park, boats to take you onto the lakes of fishing from within the park, and various ways of getting to see the glorious mountain and lakeside countryside that surrounds Killarney, including various boat-walk-jaunting car day trip that takes in the famous Gap of Dunloe. We enjoyed a round-the-lake trip on a boat from Ross Castle. The area around Ross Castles is, in itself, a beautiful area in which to wander with its lake and mountain views. There is an adequate car park here. You can even walk from here to the town through parkland. Atmospheric Ross Castle - from where you can get boat trips on the lakes! Yet another option. 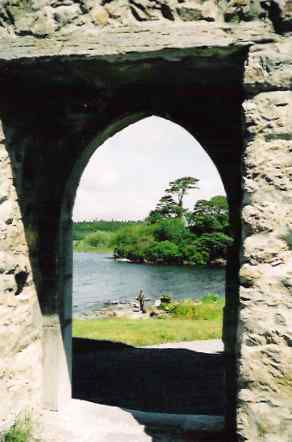 Take a ferry from Ross Castle across to the 23-acre Innisfallen island in the lake. It housed a monastery for 1,000 years from the 7th century and currently has the remains of a small 11th/12th century Hiberno-Romanesque church and extensive remains of a 12th century Augustinian Priory. The important Annals of Innisfallen, the earliest source of Munster history, were partly written here, and it is believed that High King Brian Boru (no less) was educated here. (But then there were lots of kings in Ireland, to be sure. Most people are related to one.) 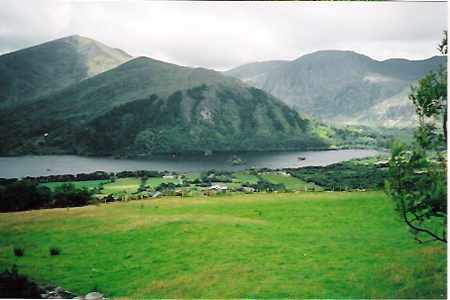 There is a grassed-walk around the perimeter offering a panorama of mountain, lake and woodland. Like most of the land around Killarney, it is tree-covered. I hope you get the ferry back, or it will be a long night. If you don't, however, gain comfort from the thought of a shorter than usual night, for it gets dark much later in this region than in England because of its extreme westerly location. I took a picture (in Killarney, not on the island!) that looked as if it were taken in daylight at 9:45 pm one July evening. The Gap of Dunloe is a narrow, winding mountain round that squeezes between the mountains of Macgillycuddy's Reeks (1010m) and Purple (832m) and traverses three small lakes in the vicinity of Kate Kearney's Cottage. If you don't have a head for driving on mountain roads there are numerous ways other people can take you through the gap. But if you like a motoring challenge, have a head for heights, and are a careful and experienced driver, try this. 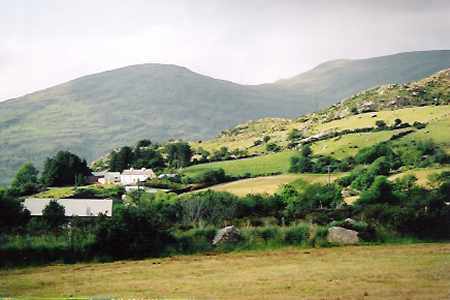 Head out first on the N71 to Moll's Gap and then turn off on the R568. Take a right soon afterwards for the marked — and usual — Gap of Dunloe road (or consider my diversion given in square brackets below). If the road seems too narrow to be a normal route, don't worry unless dusk is falling — you probably really do have the right road. You climb high up before you descend to the narrowest part of the Gap. And it wiggles a lot! You did test the brakes first, didn't you? Take care! Like most trips in Ireland, it takes a lot longer on the road than you ever imagined looking at the map. This is because everywhere is so spaced-out in Ireland (I'm not talking to Americans here: they're always spaced-out; sorry, couldn't resist the pun, please don't be upset at my poor English ironic humour.) No, truly, you think a trip to a couple of towns on the map will be a doddle and it takes an absolute age to actually do it. Allow for this by adding 50% to the time you imagine it might take looking at the map of Ireland! The same road that take you across to Fossa has a signpost to Lough Leane, the biggest of the three Killarney lakes, and you can park a car in the lane just before the road bends sharply left at a bridge and walk straight up the facing lane, through a gate, and walk straight ahead through Tomies Oakwood for around 5km in order to reach O'Sullivan's Cascade, a three-tier waterfall that feeds the lake. Someone likes ripping off the signposts, so use the map in the guide to help you find this. After walking through the woods for the 5km or so, keeping on the left-side of the loop walk, at the top of a rise is a track leading left (just before a bridge that spans the stream feeding the top of the fall (but offers no view of it). Within around 20 yards there is at footpath to the right that descends steps to the base of the waterfall. How dramatic it is depends of recent rainfall. Whether this path is signposted depends on the locals! If you miss it you will find yourself descending towards the lake itself; wrong! When you climb back to the main track after seeing the fall, the short route is the way you came; a longer route, to the left, takes you across a bridge at the top of the fall and back around the wood by a different route that meets the original. 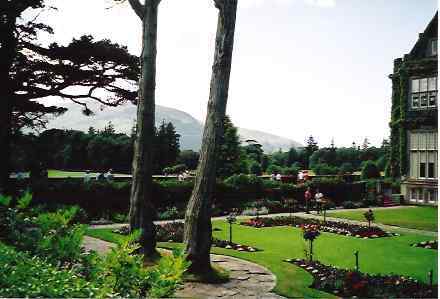 Muckross Park and Gardens should not be missed. Both the interior and the exterior of the house are a sight easy on the eye, and the grounds themselves, next to the lake, offer walks in paradise. You can walk in the grounds free or pay to see inside the house or a special area of gardens. The interior of the house has period furnishings and the tour guide makes this a most interesting place to visit. This is a house anyone would have enjoying living in — given half a chance! Even the architecture is great and the architect even had the foresight to build in pipes for yet-to-be-invented plumbing! The nearby restaurant is convenient, air-conditioned and good for hot or cold snacks. And the house, itself, is well worth visiting. Muckross House was built for Henry Arthur Herbert and his wife, the watercolourist Mary Balfour Herbert, and was completed in 1843. With six year's notice of the visit of Queen Victoria, he just about had enough time to prepare for what was to be the queen's two-day visit — complete with 100 servants and courtiers. (Didn't they just know how to live then? Imagine transporting, bedding and feeding that lot out in the sticks.) Herbert rather expected a title as a result of all this hospitality but, unfortunately, the death of her husband shortly afterwards turned the queen's thoughts very inward thereafter and the visit was quickly forgotten. So were the anticipated increased fortunes of the Herberts who hoped to profit from a title. He went broke,and the house was bought by an American couple for their daughter as a wedding present. (What a present. This house is fit for royalty.) She died of pneumonia at an early age and her husband (a senator) and his benefactor- in-laws then gave the house and the entire estate to the nation. Thanks be for that! It is now a paradise on earth for all to enjoy. The surrounding landscaped and very natural parkland is outstanding, and the view from the house terrace is second to none almost in the world, I would say: grass down to the lake with its glinting waters and purple mountains as a backdrop. There is also a Traditional Farms feature that will interest the children. So this is a great family day out with something for all. 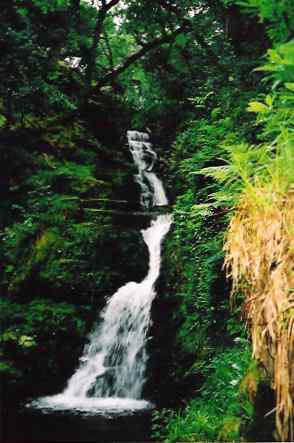 A waterfall you can reach near Muckross House is called Torc Waterfall. A great way to see this is to take a jaunting car from the front of the house. The driver will rest his horse and give you sufficient time to go up to see the fall itself. Old Tim took us up there. We got it wrong, though, and thought the first piddling little fall was IT. It wasn't, and Tim knew it the moment we go back so fast: so he sent us off again to do it right! And it was worth it, and only a short — and fairly easy — uphill walk. A pretty tall fall this, as well. Or you can drive to a car park near to it from the N71. Nice. 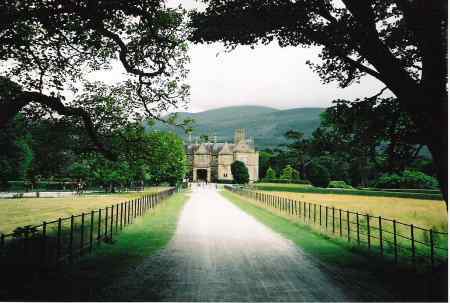 then take your faithful Guide Killarney and walk the grounds. Visit Muckross Abbey. Enjoy! This is a full day event. 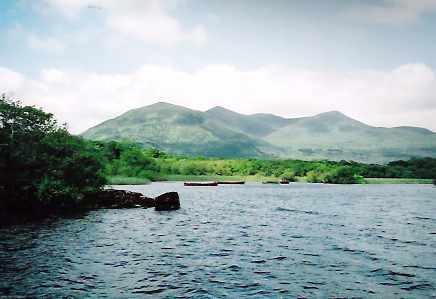 Killarney sits within the Iveragh Peninsula, and the roads that ring this area are known collectively as The Ring of Kerry. It is a delightful day trip to motor around this scenic route that is said to be the most popular drive in Ireland; it is advised to do this in an anti-clockwise direction, although I'm not sure why. (Perhaps so you can best follow the directions!) Make sure it is a clear day if you can. The day we picked turned out to be rainy, and the best parts of the coastal area remained a mysterious, misty experience to us. But we did take in the Guide's initial suggested diversion around Caragh Lake which was scenic and beautiful even in the rain! This route eventually passes through Kenmare which is a nice little town for a break to stretch your legs and take some refreshment. Even I couldn't get lost in Kenmare. 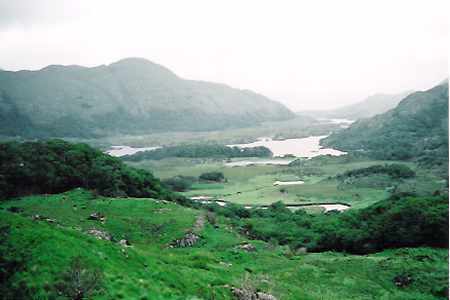 The route takes you back through Moll's Gap, mentioned on the Gap of Dunloe circuit above, and it passes the parking place known as Ladies View which Queen Victoria's ladies-in-waiting pronounced the most beautiful in the land. It is: fantastic views across the mountains and the entire lakeland thereabouts. The sun shone on us for much of the time on this circuit, which was clockwise this time, allowing us to unwind. After the wide sands of Dingle, a little fishing port, the coastal road takes you by Dún Beag Promontory Fort at Fahan. Although small, it is an experience to creep through the tiny opening into a single clochhaun — or Beehive. Four people inside could just about stand up, but the sides slope deeply in to the middle from floor level. Getting into this — and hopefully out again — is only for the nimble, although even wheelchairs can reach its entrance. I got in and out again, so it can be done. The entrance is about two-feet square! This fort was built on a cliff edge to reduce possible areas of attack. Nearby is a famine cottage museum. Further down the road are a whole series of Beehives, built by early Christians as homes. You can walk up on the hillside and get into these quite easily, for they range from small to very large. The largest was about 16 feet in internal diameter. Interestingly, although not much is known about these Beehive structures, it seemed plain to me they incorporated secret chambers to hide, perhaps, the more vulnerable members of their households. One had a stone removed to reveal a shallow underground chamber fit for little but hiding, and another had a tiny wall opening into a heavily stone-surrounded area. 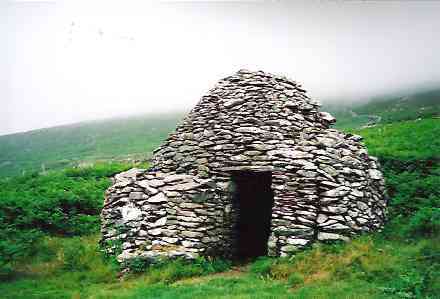 These structures have stood the test of time for strength, but they seemed quite vulnerable to attack, for the upper stones of the beehive structure would be easy to remove — as they probably were, in good weather, for ventilation and chimneys — and an attacker removing them would have found its occupants very vulnerable below. There is evidence they had doors. 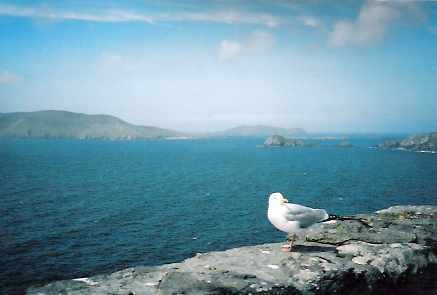 This peninsula has beautiful scenery, including views across to the Blasket Islands. Thanks to its mild climate an introduced species of fuchsia provides much colour in the hedgerows. I would recommend you finish this tour by passing through the Conor Pass from Dingle to Stradbally on Tralee Bay, with its great viewpoint at the summit of the pass. (Go slowly near the top bend or you'll miss it!) This road is deceptively wide and good on the way up. The Tralee side is a different story, however: narrow and old. After descending the mountain you will shortly see a windmill and scenery that looks like something in Holland! Then there is the Beara Peninsula and its Healy Pass through the centre. (I do like to pass through passes, and you'll have gathered by now.) This peninsula offers the most rugged seascapes and nowhere else in Ireland is there such an extensively panoramic route by the sea (so the guide books tell me). But there is a price to pay. It would be a very full day from Killarney, many of the roads are narrow, many are slow to navigate, and tourism is not top of the list. (We took a coffee break at a gift shop and it turned out to be instant coffee in someone's sitting room behind the shop.) But, if you like to see Ireland in a more natural state, here's your chance. We took a brief trip to Lauragh and Adrigole through the Healy Pass and then followed this with the pancake version of the Gap of Dunloe for a day trip. The reason was I had done quite enough driving by this day and I couldn't face more windy roads after sampling those to Lauragh. Of course, maybe they got much wider and better after that! We stopped off at pleasant little Glengariff on the way back where there are numerous pubs and eating places. 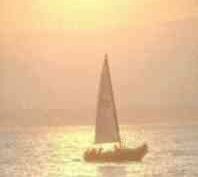 There is also the chance of a boat trip to an island garden. Indeed, the mild climate of the Beara Peninsula means there are apparently dozens of different gardens to visit hereabouts. But time: she is such a hard task-master. I could go on. Indeed, some would say I have already, to be sure. So I won't at all. I will just finish by saying that too many English people ignore this beautiful isle. I was one of them. Tempted by cheap flights to other destinations in Europe, the expensive car ferries to Ireland do not make it an ideal destination. Nor does its variable weather. But now there are numerous cheap flights to Ireland, so do what we did, fly cheaply, hire a car, experience Ireland. It's only just off our Isle, so we should know it. So do it if you're English. And if you're American or Canadian and have Irish roots, surely it is your duty? And if you are any other nationality and want a different experience, then try Ireland. And if you want real beauty, do try Killarney. The Killarney region offers so much more for the explorer and walker I cannot possibly cover it all. The Old Road to Kinmare, for example, is beautiful and wild, and it's your choice whether you walk a short way or get serious; it links with the Kerry Way if you are a really serious walker. You can begin this by parking in the car park at the end of the road left off the N71 just beyond the vehicle entrance to Muckross House. Fantastic. Want more walking? Well, there's Torc, Dingle Way, Beara Way, Carrantuohill, Purple Tomies and Shehy Mountain Ridge, Hag's Glen, Mangerton Conifer Woods, the North Face of Torc.... and the rest, including numerous garden and nature trails! I haven't done them all just yet, by the way! So did I like Ireland? What do you think? Although, I have to say, I do admit to being a bit biased because of where we were based. (Most people move on as they travel between B&Bs, unlike us.) I was pleased I chose this as a settled base. The country around Killarney is so beautiful and much of the rest of Ireland that I saw in the south and between Killarney and Dublin is fairly flat and looks much the same: open country, small fields, very green, and a variety of towns: some pleasant, others characterless. I doubt I would find these places had the same magnetic appeal. What was that about kissing the Blarney Stone? No, I didn't. I did intend to get to Cork and find that blessed stone in Blarney Castle, to be sure, but time ran out, so it did. Anyway, Kerry was too beautiful to leave. Too beautiful by far. And to think I never visited Ireland before because I was always postponing the effort. Shame on me. But I'll be back, I'm not finished with Ireland just yet! If you enjoyed reading the above article then you will probably also enjoy London by Ed, and Sicily, also in Europe, and our latest articles covering the Orinoco Delta, La Mata, Marbella and Beijing.